Terra's modern fusion design shares Japanese and western flavours with 3 bedrooms split over 2 floors. Open plan kitchen-dining and lounge room, Terra is fully furnished and equipped with everything you need to fully enjoy a self catered holiday in Niseko. 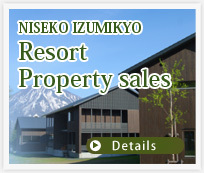 Located in a quiet secluded area, a minute walk to the free shuttle service that accesses the Hirafu main village and ski lifts of Niseko United ski area. Perfect for family and group stays.